So I called the number I found for Abbiati (I never reveal my sources, but it was my husband’s cousin’s friend’s uncle’s best friend’s barber, who lost a lot of business when Abbiati went with the bald look.) In my perfect Italian (I used a lot of imagination on this one,) I explained myself and stopped just sort of begging to ask to spend a day following him. He was surprisingly nice and agreed right away, and we set it up for me to meet him at Milanello. After the usual girl-panic of “what do I wear to meet my favorite Milan keeper ever” (I went with a sporty casual look, kind of an “I care, I’m sensible, but I’m not trying to be a WAG” look,) I showed up to Milanello 2 hours early and bit my fingernails until they nearly bled (Actually, I don’t bite my fingernails, that’s a disgusting habit, but it kind of adds something to the narrative, don’t you think?) 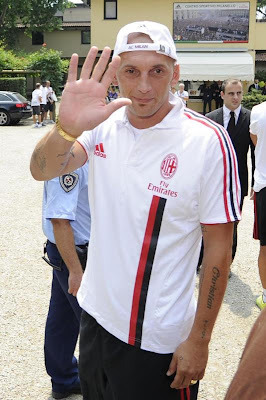 To my delight, the 6’4” (1,91m) Abbiati shows up in a Mini. An itsy-bitsy-teeny-weeny orange Mini. How does someone so big fit in a car so small? It defies the laws of physics. Time for some quick autographs (but I played it cool and didn’t ask for one, as I already had an autographed jersey my friend got for me at home) and then it was off to the beach. (Yes, I know Milanello is landlocked, but when you are using your imagination and Google image search gives you a beach pic, you go to the beach.) 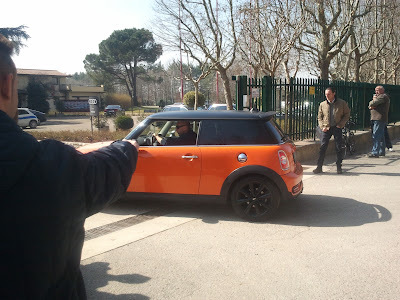 I gleefully watched him get in his Mini and drive off, it actually looked surprisingly easy and natural, no wonder he’s our number one. Posing for pics with female fans... it's a rough job, but he is committed. At the beach, he was barely able to relax, I guess being a 6’4” bald footballer makes you stand out a bit. Anyway, lots of people came by to get pics and autographs, and he was very patient and kind to all. No wonder he was given the captain’s armband this season and will be vice captain now, the man is pure class. After the beach, he told me he was going out for the evening. I didn’t want to intrude, but he told me to meet him in front of the Dolce & Gabbana store. Being the fashion freak that I am, I had to see what he would wear to go out. So even if it meant I had to figure out another outfit, I showed up to take a pic, then said my goodbyes and left the poor man alone. He was very hospitable, but I’m sure he was relieved to finally be rid of me. 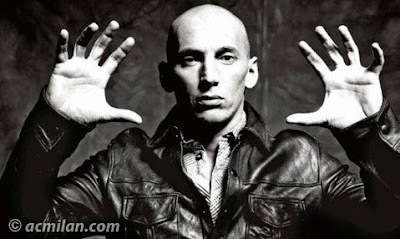 abbiati character goalkeeper Humor looks fun to me misc. nonsensical nothings snow job this blog has lasted a whole year?